Sign up now to stream Land of the Lustrous, subs, tons of dubs, OVA's, simulcasts, plus the all new Dubcast℠ editions and more! * Check out our supported devices here. Phos has recovered from the disaster at sea and has gained a new ability! What will happen to Phos as they put their skill to use as a lookout? Master Kongo finally decides to give the young Phos an assignment. Much to Phos dismay the assignment is to write an encyclopedia about the world. Phos is looking for ideas for the encyclopedia but is struggling to come up with anything. They go to Diamond for help as they have been working on a new technique. Unable to find Phos the group is concerned of what happened to them. However, Diamond is determined to bring Phos back. Phos is attacked, but manages to make a new friend out of the attacker. Together, both travel to the ocean where Phos learns more about the past. Phos is captured by the Lunarians. King reveals the truth behind the deception but is interrupted by their slumbering brother. It's winter time and everyone is discussing the best way to make it through the cold. Meanwhile, Phos gets roped into Antarcticite's yearly duties. 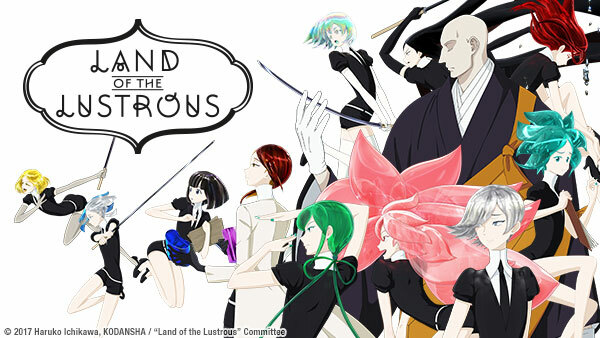 Phos has lost their arms, but Master Kongo believes them to be at the Chord Shore. Antarcticite makes it their mission to piece Phos back together. Spring comes with a bitter taste for Phos as they try to cope with the kidnapping of Antarcticite. In the meantime, the gems are trying to come to terms with the new Phos. To help them get a better grasp of their new-found abilities, Bot and Phos team up. Dia on the other hand feels a bit left out. A recent incident has ignited some internal questions in Phos’ mind. Who’s Shiro and why is Sensei so kind to this Lunarian? Phos must now decide to follow their instinct or back down. What will happen if they try to investigate further? There was a problem playing the next video.